· This is a “Twilight event” starting at 1800hrs (6pm), ticket holders to enjoy a day party, the most amazing sunset and the resorts best beach club event by night. 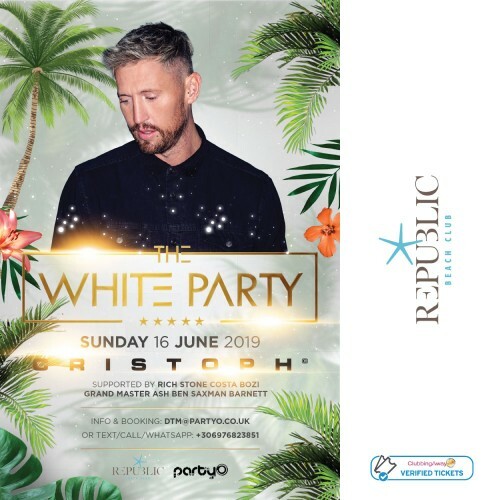 · Biggest line-up of DJs and entertainment in Zante…which are all exclusive to The White Party and nowhere else in Zante this summer! · Live Saxophonist and Percussion at every event with vocalists and fire girls alternately. · All entertainment is flown in from around Europe and the UK. · Snacks and Finger food. …And even more entertainment. This IS this White Party, Zante.